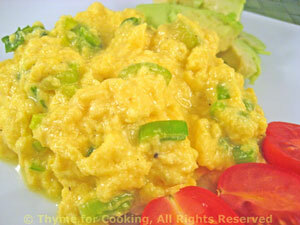 Scrambled Eggs with Green Garlic, Thyme for Cooking spring gourmet. Green garlic looks like a green onion or very small leek and has a wonderful, mild garlic flavor. Use it all, including the green tops. The eggs should be removed slightly underdone: the residual heat will finish cooking the eggs before you get your fork into them and they will stay more tender and creamy. Green Garlic: Cut the stem ends off the green garlic and remove the outer layer. Slice about 1/8" (.3cm) thick including green tops. Avocado: Cut avocado, remove pit. Remove half from shell and slice. Divide and arrange on plates. Eggs: In medium nonstick skillet melt the 2 tsp of butter over medium heat. Add green garlic (or leeks and garlic) and sauté just until starting to come apart, about 3 minutes. They should keep a bit of crunch. In medium bowl whisk eggs. Add yogurt, salt, pepper and whisk. With a knife cut the 1 tsp of cold butter into tiny pieces and add to eggs. This will melt as the eggs cook making them very creamy. Add the eggs to the green garlic in the pan and with a spatula gently stir the eggs, mixing in the green garlic. When the eggs are almost, but not quite, set, divide them and put on plates. Garnish with tomatoes and serve immediately. Note: To store a cut avocado wrap it in cling film, making certain that the cut surface touches the film, put it cut-side down on a plate and refrigerate.